Christie said it is “outrageous” that there have been “some months” during the Obama administration “where more people have gone on to Social Security Disability than have gotten a job.” But that’s true of every administration since 1986, which is as far back as disability data are available online. He also said New Jersey went “an entire decade without job growth,” from 2000 to 2009, before he became governor. But New Jersey gained 130,700 jobs from January 2000 to January 2008 before the Great Recession wiped out those gains. The same was true for the U.S., which had a net job loss of 1.3 million during that 10-year span. Christie made his remarks April 17 at the New Hampshire Republican Leadership Summit, a two-day event that was attended by many of the party’s declared and potential presidential candidates. He spoke briefly about his plan to rein in the costs of what he called “entitlement programs,” including Social Security, and then took questions. At one point, he was asked what he would do to prevent Social Security Disability from going bankrupt. The Social Security trustees estimate that the disability trust fund reserves will be depleted by late 2016. “Lawmakers need to act soon to avoid automatic reductions in payments to DI [disability insurance] beneficiaries in late 2016,” the trustees said in a 2014 annual report. Christie blamed President Obama for the fund’s financial problems. Christie, April 17: There have been some months in this administration where more people have gone on to Social Security disability than have gotten a job. That’s outrageous. And that’s why the system is near bankruptcy. 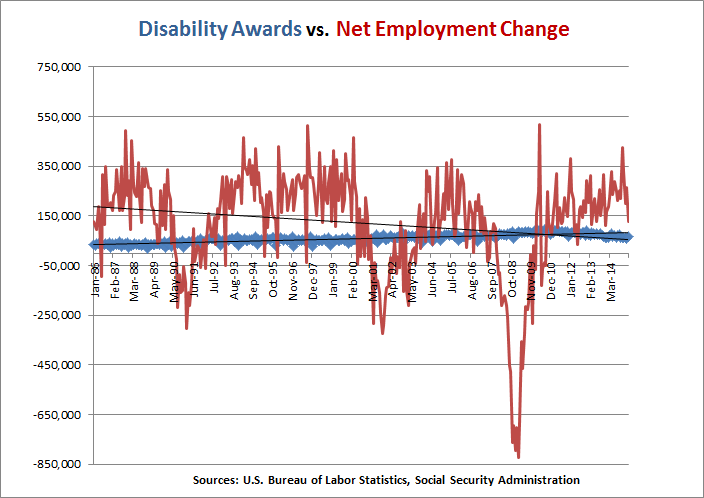 The last month that more people went on disability than got jobs happened nearly three years ago in June 2012, when the U.S. added only 35,000 jobs and 84,766 were approved for Social Security Disability benefits. So, Christie is not wrong. But he singles out “this administration,” as he refers to the Obama administration, when actually the same thing can be said of every president since 1986, which is as far back as the monthly disability data are available online. It is particularly true of administrations that have governed during a recession when monthly job losses or weak job gains were the norm. That would include not only Obama, but Presidents George W. Bush, George H.W. Bush and Ronald Reagan. In fact, under George W. Bush, who was president during two recessions, the number of people who went on Social Security Disability outpaced the number of people who got jobs in 52 of the 96 months — more than double the rate of Obama. During George H.W. Bush’s one term in office it happened in 21 of 48 months. Both Obama and George W. Bush inherited recessions, but Bush also left office during a recession, which explains the high number of months during his administration when disability approvals outstripped job gains. In fact, the number of people who went on disability during the Bush administration far exceeded the number of people who got jobs. That’s the only time that that has happened during the last five administrations. Under Bush, there were 1,281,000 total non-farm jobs added, from February 2001 to January 2009, or 13,000 per month. But 6,400,157 people were awarded disability during that time – an average of 66,668 people per month. By contrast, there were 7.2 million total non-farm jobs created under Obama, from February 2009 to March 2015, an average of 97,000 jobs per month. During that same time, there were nearly 5.9 million people awarded disability for an average of 79,158 per month. Christie has a point about the need to shore up the disability trust fund, but he misled his audience by saying there have been “some months in this administration” when there have been more people going on disability than getting jobs. That can even be said of President Clinton, who presided during a time of economic expansion. As we have pointed out before, the economy added 22.9 million jobs when Clinton was president. Even so, there were eight months under Clinton when more people went on disability than got a job. Another member of the audience asked Christie about his state’s lackluster job growth rate, which as we have written has badly trailed the rest of the country during the Christie administration. The governor responded by blaming previous Democratic legislatures for raising taxes and stunting growth before he became governor in January 2010. “We had had an entire decade of the 2000s without any job growth,” Christie said, referring to the period from 2000 through 2009. There were job gains in New Jersey, but they were wiped out during the recession, as the BLS chart below shows. In January 2000, New Jersey had 3,961,500 jobs, and the number of jobs peaked during that time in January 2008 at 4,092,200 — an increase of 130,700 jobs or 3.3 percent. By January 2009, the number of total jobs had fallen to 3,956,800 – a decline of 135,400 jobs in just one year. By the time Christie took office on Jan. 19, 2010, the number of jobs in New Jersey was at 3,853,400. New Jersey was not alone, of course, in losing jobs during a 10-year span that included not one but two recessions — from March 2001 to November 2001 and again from December 2007 to June 2009, as determined by the National Bureau of Economic Research. The U.S. lost more than 1.3 million jobs during that time, dropping from 131,009,000 jobs in January 2000 to 129,685,000 in December 2009, according to the BLS. And two of Christie’s potential presidential primary opponents — Wisconsin Gov. Scott Walker and Louisiana Gov. Bobby Jindal — can also say that their states went the “entire decade of the 2000s without any job growth.” From January 2000 to December 2009, Wisconsin had a net loss of 102,300 jobs and Louisiana had a net loss of 35,100 jobs. As we’ve seen with both of Christie’s claims, context matters. Previous StoryGender Pay Gap in Clinton’s Senate Office?